POLICE are set to use advanced electronic equipment such as digital cameras to try and stem the tide of a road carnage that continues to claim dozens of lives on the country's highways. This was said by President Emmerson Mnangagwa soon after he had officiated at a police pass-out parade at Morris Depot, Harare on Thursday. 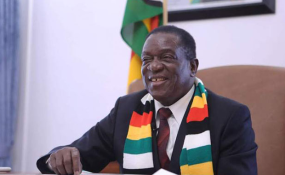 Mnangagwa said his government was committed to helping police reduce crime and further increase public safety through the provision of modern training and capabilities. "The ZRP must also play an enhanced role in the struggle against deadly traffic accidents, and they will be supported through a new electronic traffic management system, the installation of digital cameras and other monitoring gadgets at traffic intersection and along our high ways," he said through his official Twitter account. The past two weeks have seen almost 90 Zimbabweans die in two road accidents. Two buses collided in Rusape, killing 46 while 42 died in Matebeleland South last week after a bus they were travelling in burst into flames. Several more accidents involving smaller numbers of casualties continue occurring on the country's roads, becoming a major source of worry to authorities and citizens alike. Also at a press briefing following a cabinet meeting on Tuesday, Information and Publicity Minister Monica Mutsvangwa said cabinet had "called for greater enforcement of the use of integrated traffic management systems and increased highway police patrols". In his comments following the police event, President Mnangagwa also urged police to shun "all forms of corruption and self-enrichment". "We are committed to help the ZRP to reduce crime and increase public safety through the provision of modern training and capabilities," he said. "Central to their remit is the fight against corruption, and the ZRP will be increasing its co-ordination with the newly established Anti-Corruption Unit and other bodies to bring to book all economic criminals. "I encourage the public to be forthcoming in reporting crimes of all forms at every level. There are no sacred cows. No one is above the law. Our laws will be enforced without fear or favour." His comments also follow continued arrests on some former government ministers and some business persons accused of corruption.